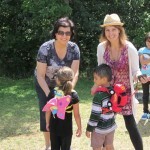 My sister, Nia Vardalos was is in Winnipeg last summer shooting a movie for American Girl; a company that she admires. The movie, American Girl: McKenna Shoots for the Stars will be released July 3rd and then shown on TV on July 14th on NBC, at 7pm Central. American Girl celebrates girls and all that they can be through the development of products and experiences that help girls grow up in a wholesome way. Products such as dolls, books, magazines and movies encourage girls to enjoy girlhood through fun and enchanting play. The retail stores in large cities throughout the U.S are magnificent. If you ever have a chance, please visit as the whole concept is ingenious. Nia was matched with her daughter through American Foster Care and took this movie role to be “cool” among her daughter’s peers! She is the National Adoption spokeperson in the U.S. and advocates for children through several organizations that she supports. The photos are of Nia an I during visit to Assiniboine Park in Winnipeg last summer. 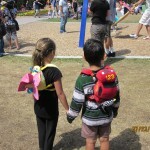 The children wearing Safe2Go Backpacks are her daughter and our nephew.